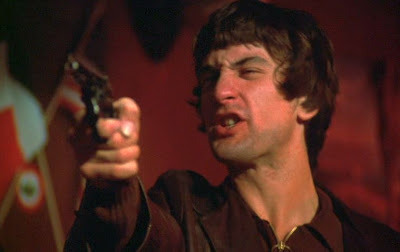 Martin Scorsese’s Mean Streets (1973) was a breakthrough film, both for himself and for actor Robert De Niro. Although both Scorsese and De Niro were barely thirty years old at the time and at the outset of their long successful careers, Mean Streets still stands as a showcase of their very best work. The film’s story concerns life of some young men in New York’s “Little Italy” area of lower Manhattan, a locale familiar to both Scorsese and De Niro, who grew up in those environs. 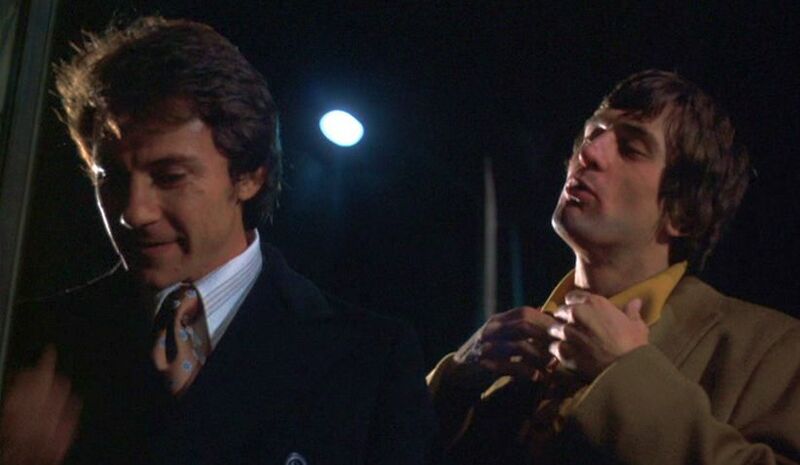 In fact Mean Streets is said to be a semi-autobiographical account of some of Scorsese’s experiences and was intended to be a sequel of Scorsese’s first feature, Who’s That Knocking at My Door? (1967). 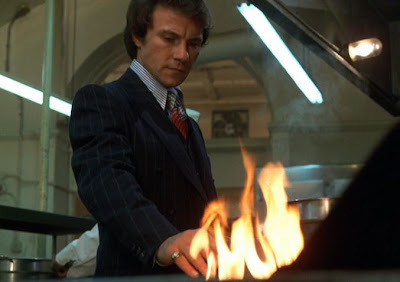 Charlie (Harvey Keitel), who seeks to work his way up in the New York mafia by working for his uncle Giovanni, a high-ranking figure in the Italian crime “family”. Johnny Boy (Robert De Niro), an irresponsible friend of Charlie’s who constantly borrows money from his friends and is hopelessly in debt. 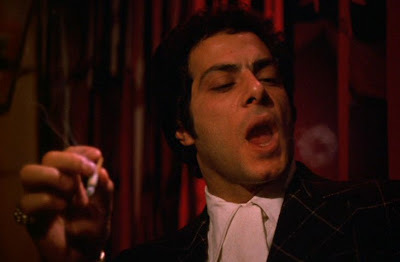 Tony (David Proval), who runs a bar in Little Italy where everyone hangs out. Michael (Richard Romanus), another young man who seeks financial gain by various shady business operations, including working as a loan shark. 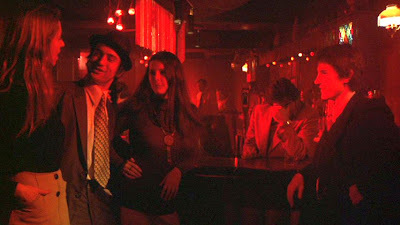 The narrative style of following the disparate stories of people grouped by some common goal has a long tradition, particularly in connection with war films and special joint missions; and Mean Streets would go on to inspire renewed popularity of the genre, such as The Deer Hunter (1978). But actually, Mean Streets is not really about that group just listed, but is primarily just about Charlie, with the others on the periphery. In fact the focalization of the film is almost exclusively with Charlie, and everything is seen from essentially his perspective. Respect, Group Belonging. Charlie works as a loan collector for the Mafia and wants to be a respected member an organization that places a great emphasis on dignity and “honor”, as they define it. Moral Obligation. Although part of an organization that operates by its own, questionable rules, Charlie is a Roman Catholic and deeply concerned by the consequences of sin. On several occasions Charlie prays in the cathedral and wonders about the eternal horrors from God’s punishment of Hell fire that await the guilty sinner after death. Compassion. Charlie is close friends with Johnny Boy and tries to look after him, not only for moral reasons related to some obscure family connections, but also out of genuine friendship. He just likes being with Johnny Boy. Love. Charlie is having a secret love affair with Johnny Boy’s cousin, Teresa (Amy Ronbinson), a comely girl who offers him true love. Like most young men, Charlie avoids making any commitments, but his feelings for her are genuine. But Charlie is attracted to other women, too, including a glamorous black go-go dancer. Unfortunately, all these tensions on Charlie are in conflict with each other. Giovanni is a stern patriarch and warns Michael not to associate with anyone or activity that could lead to dishonor. He tells Michael to say away from the recklessly irresponsible Johnny Boy with the admonition, “honorable men go with honorable men.” Similarly Giovanni dismisses Teresa (whose relationship with Charlie is unknown to him) as a mentally ill person, because she suffers from epilepsy. Nevertheless, Charlie tries to straighten out Johnny Boy, continues his clandestine (unbeknownst even to Johnny Boy) affair with Teresa, tries to maintain good relations with other hoods like Michael and Tony, and worries about living a moral life up to the standards of God’s precepts. It’s not easy in his muddled world, and this is what drives the film. 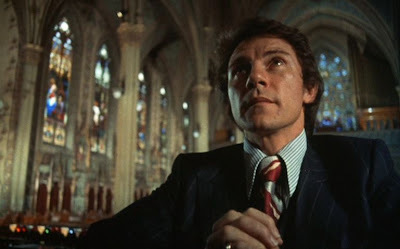 The narrative progression in Mean Streets is somewhat episodic. This highlights a Scorcese strength and weakness: very realistic settings and active cinematography that produce a spontaneous vitality to individual scenes – even if those scenes are not well connected together into a coherent narrative threading. Even so, you might say that there are roughly three sections to the story. The first third of the film focuses on the semi-violent social milieu of Charlie’s Little Italy world, and it also introduces us to Charlie’s special problem: the terminally feckless Johnny Boy. In particular, Johnny Boy owes several thousand dollars to Michael, whose business it is to collect his money from deadbeats by any means, fair or foul. Early on Charlie, Tony, Johnny Boy, and friends go to a pool hall to collect a debt, whereupon a violent fight breaks erupts over the payment and some perceived disrespect. There is also a gangland murder at Tony’s bar (involving a brief appearance of Keith Carradine), because of what was perceived to be an insult to some senior Mafia member. After we have been introduced to the various social tensions, the film delves into the relationship between Charlie and Teresa during the second phase of the film. Charlie has other amorous intentions, though, and he finds himself attracted to a black go-go dancer at the bar. But his community-influenced prejudice against blacks prevents him from following up on his inclinations in that direction. Similarly in another scene later, Michael feels repugnance when he learns that a girl he likes has kissed a black man. Although this is the big city, prejudices and clannish traditions prevail in these circles. The final section of the film involves the increasingly intense standoff between Michael and Johnny Boy, with Michael in the middle, trying to defend his errant and self-destructive friend and head off a violent confrontation. It’s interesting to compare Mean Streets with Wong Kar Wai’s As Tears Go By (1988), whose plot was reputedly inspired by Mean Streets. There are significant differences between the two films, though. While Mean Streets has some concern for the group milieu, this aspect is largely ignored in As Tears Go By, which focuses on the lonely individual and the existential tension he feels between group-oriented gangland obligations, and individual feelings of personal love. Both of these films are worthy, but you could say that Mean Streets covers a wider spectrum. In particular, there are two additional themes in Mean Streets that stand out in comparison to As Tears Go By. One of them revolves around the religious concerns of Charlie and his obsessions about guilt. Guilt, of course, is a central concern in Roman Catholicism, and it would clearly be difficult for one to reconcile life as a mafioso with the strict sacraments of Catholicism. A second and related theme is associated with pride and respect. The entire social milieu of Mean Streets shows macho-oriented men all suffering from the extreme anxiety of self-doubt. They don’t really have the inner self-confidence that they try to project towards others. These characterological issues of guilt and self-doubt are supported by superb acting portrayals of various people under stress. For example, the Michael character is a particularly well-drawn image of this machismo anxiety, and he is perpetually revealing uptight insecurity over his perceived image in front of others. Tony, the bar owner, is more laid-back, but this is primarily because he has to maintain smooth relations with this volatile crowd, and even he occasionally erupts violently when the equanimity of his bar is threatened. De Niro’s portrayal of the reckless Johnny Boy is the most memorable of all. This might have been his best performance, even though it was essentially in a supporting role. 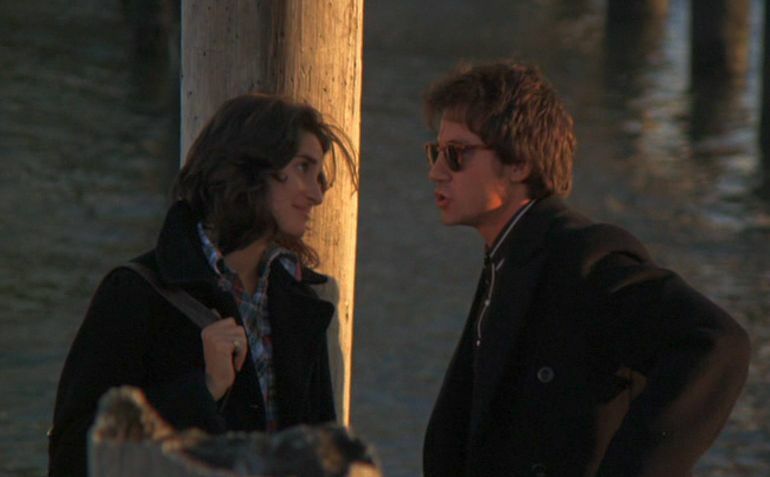 The relationship between Michael and Teresa is another strong point of the film. It has a believable electricity that stays in your memory. It is not as romantic as the encounter between Wah and Ngor in As Tears Go By, but the portrayed relationship in Mean Streets has the character of a real, ongoing and meaningful connection between two people who have a strong affinity for each other despite the ups and downs. All these complicated and conflicting relationships among insecure people (Charlie is the most balanced among the generally insecure men) make the film interesting. But basically none of these conflicts is resolved by the film’s end. This is characteristic of Scorsese films: there are ongoing conflicts that evolve for some period, but they don’t come to a clear resolution. You may say this is true to life, but I feel that this is often an aesthetic weakness in Scorcese’s tales. Nevertheless, the issues, milieu, and personal characterizations are often gripping enough to make his films worthwhile.